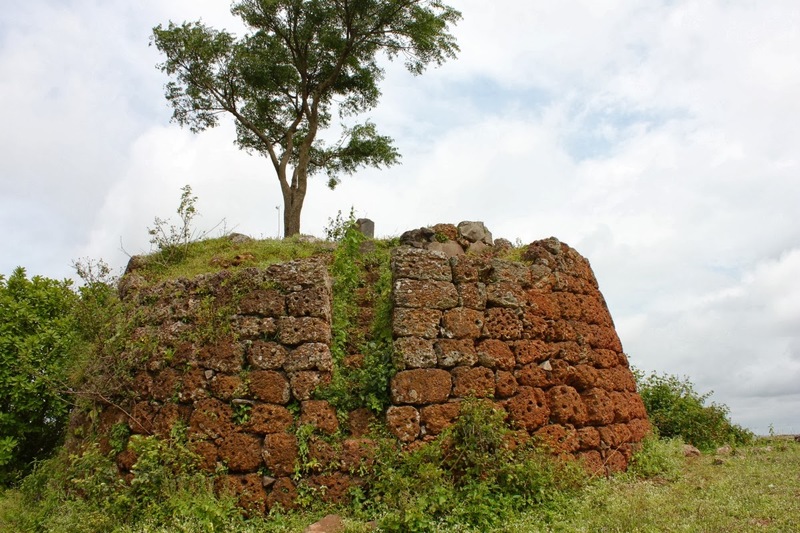 Vallabhgad hill fort is 5 kms north of Sankeshwar town. 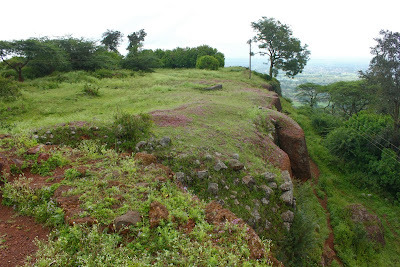 The twin peak hill is situated right besides National Highway 4. There's a road going up the hill, between the two peaks is the village and on the western peak is the fort.. a fort built by Chatrapati Shivaji. Few important spots are marked in the aerial view of the fort. The path to the main entrance starts close to point E. I went around the south-western perimeter to reach the entrance. 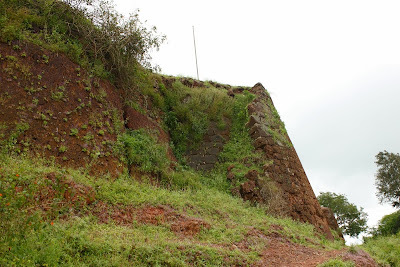 This hill is similar to Hunnur fort, the same rock type- laterite. 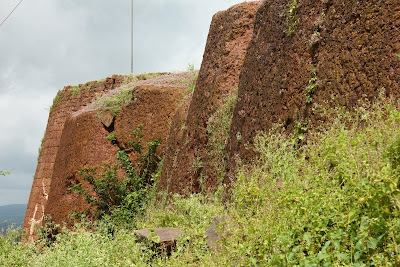 Before the fort came into being, a rough rock existed here; sides were hacked away to make them unscalable. Also walls were built to close gaps. This is one of the three entrances to the fort; a short flight of steps going straight into the fort level. 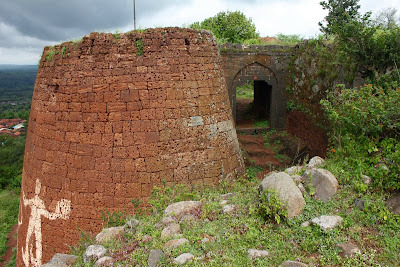 That's Nishan Burj ~ flag bastion and Mahadwara ~ main entrance. 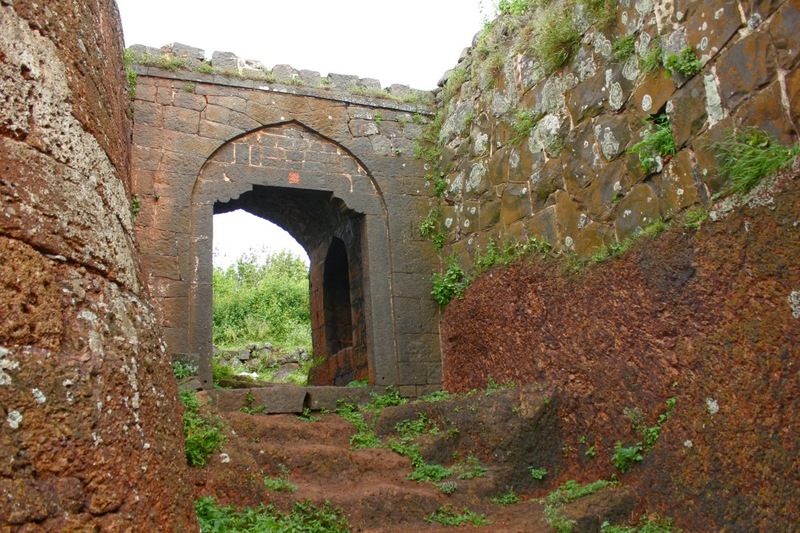 The entrance passage curves around the bastion; this is typical in forts constructed by Chatrapati Shivaji. 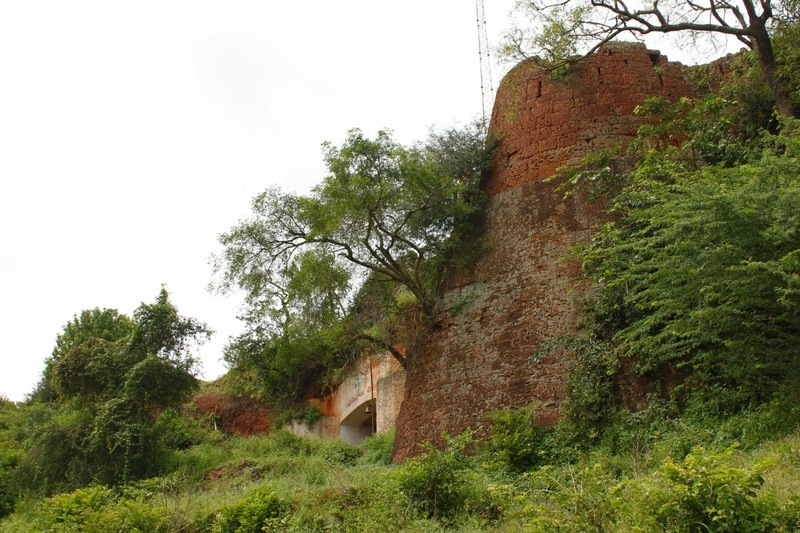 Southern side of the fort. I climb down, pass through the gateway and look back at the entrance. The gateway wall is built of harder stone- dressed blocks of granite. One side of the bastion has collapsed exposing the dirt packed into it. 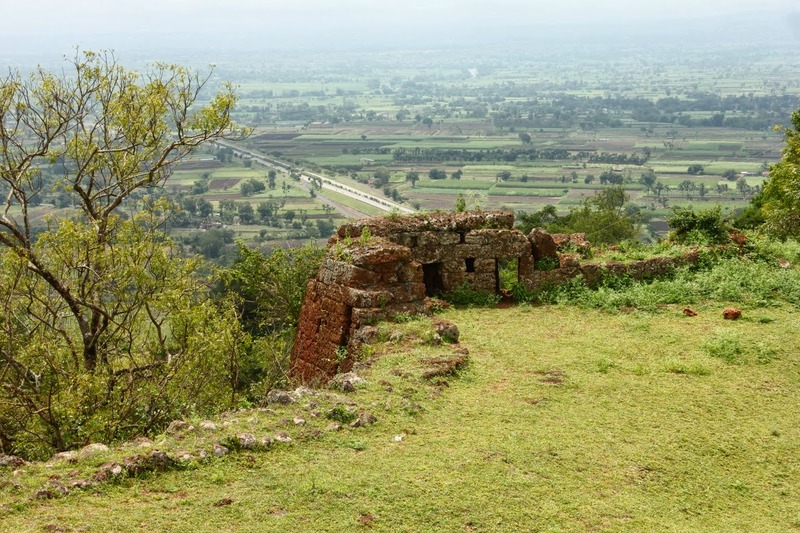 I explore the western periphery on the outside, nothing much to see there. I climb back into the fort and look around few ruins.. few standing mud walls, an old house and then this huge pit! The pit was wide and deep with vertical walls.. very scary indeed. It had no wall around it. 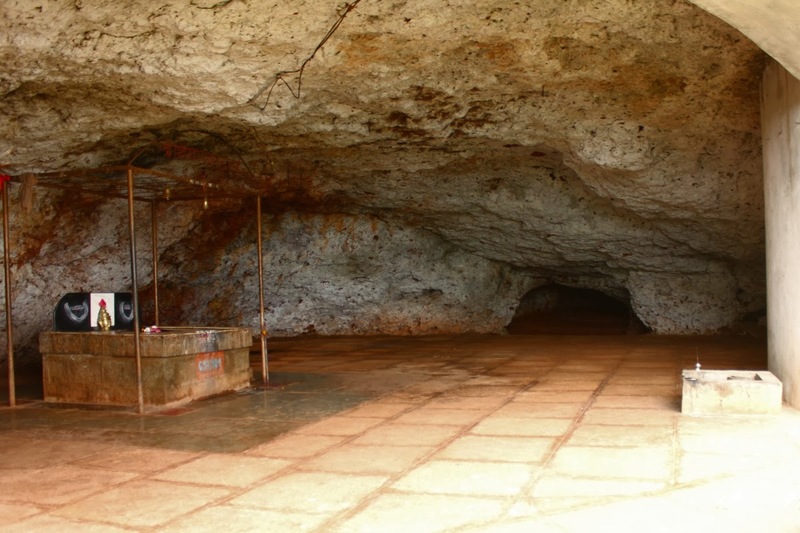 God protect people who venture during night here. This is a well locally called Andhar Bhav, sadly its dry. Walls of the pit are laterite.. this is one massive rock bed forming the summit of Vallabhgad hill. I move to the eastern edge of the northern part. 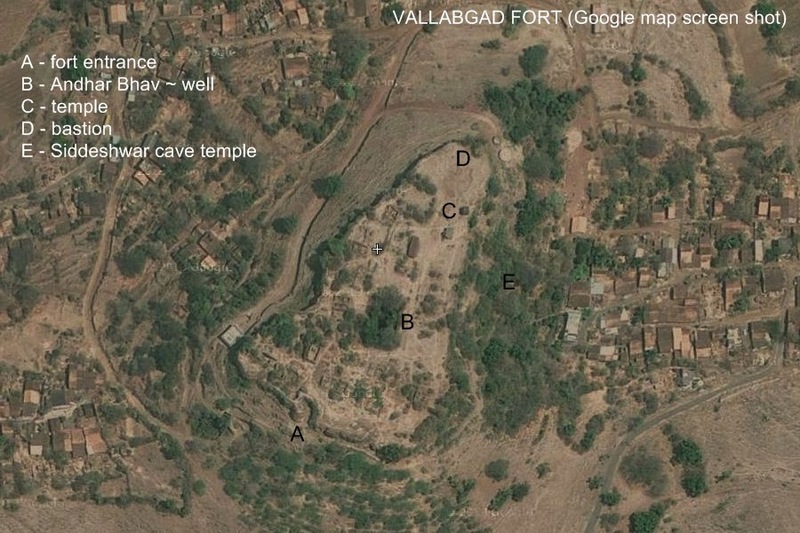 Here we have an ancient-recent temple and a small burj ~ a watch tower perched on the edge. That's the tower with a very narrow flight of steps. 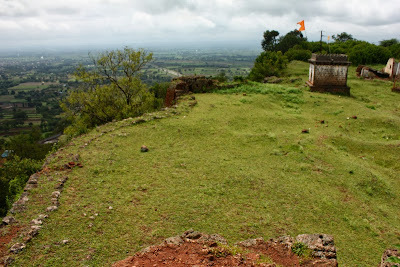 View from the tower, that small cubical structure is the temple. 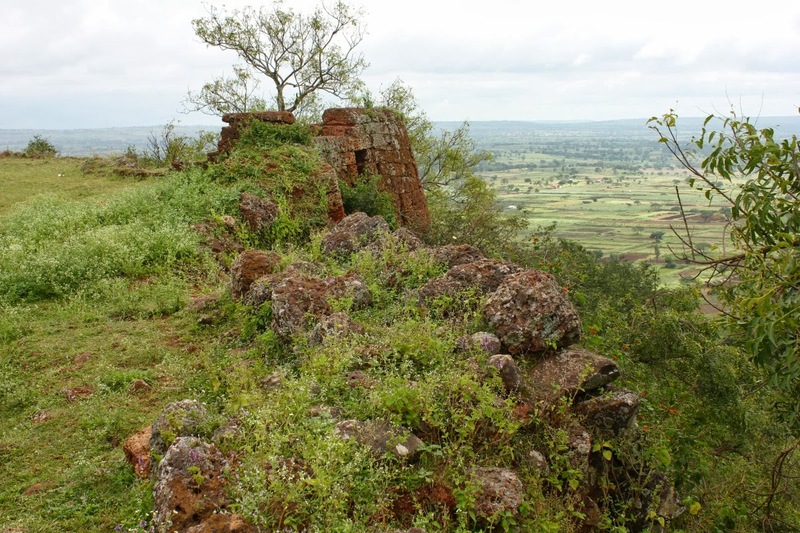 This is definitely a sentry point. 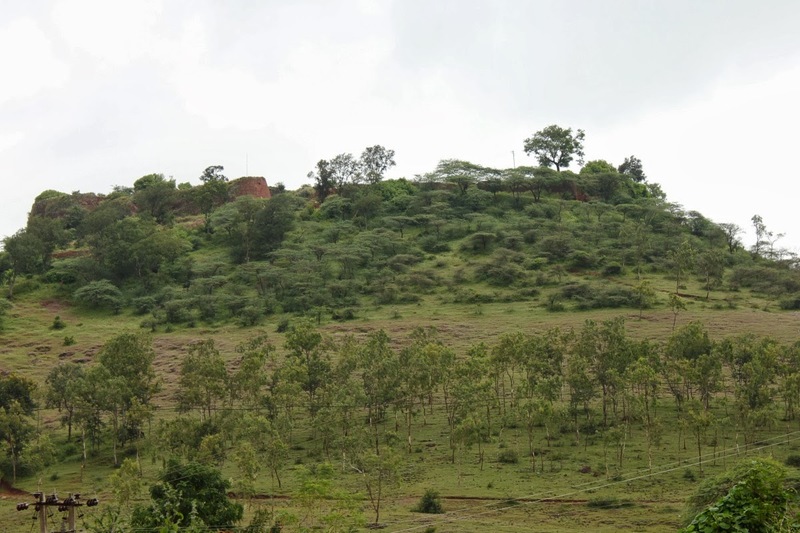 The grey line stretching to the left is NH4 pointing towards Belgaum. 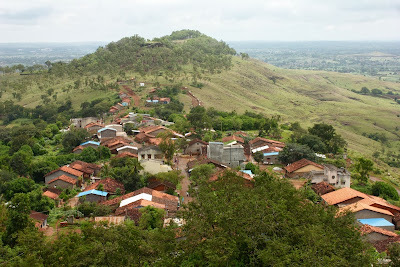 View of the village and the other peak of Vallabhgad. Looks like there's a fort like structure at the top.. to guard the eastern side of the hill. 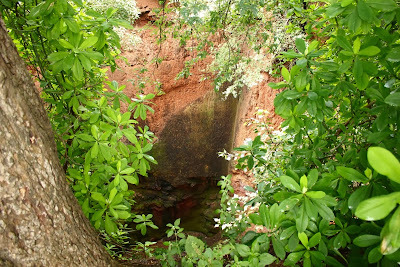 A very narrow path on this side went down the side and lead to this cave. 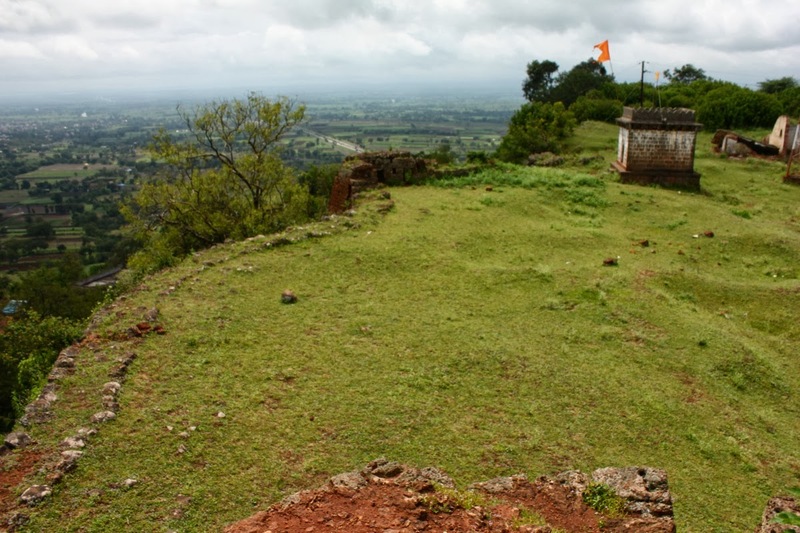 It's a Hindu shrine, a temple dedicated to Siddeshwar, an avatar of Shiva. The temple was pretty clean and tidy. Local folks must be performing rituals regularly. 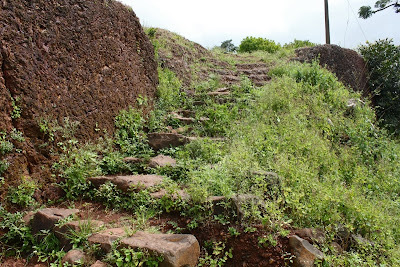 I continue down the path which went past houses and linked to the main street of Vallabhgad. Looking back the temple and the fort.. that's the watch point I stood on some time back. Prakash the cab driver was waiting patiently. We drove down through the only motorable street, some houses looked pretty old, perhaps 150 years. 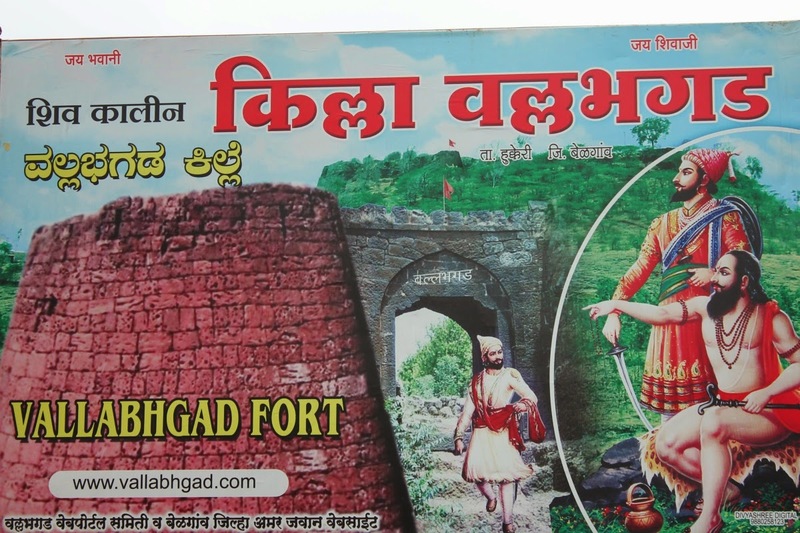 Close to the base of the hill was this board proclaiming the fort's title. I just remembered- Vallabhgad is also known as Hargapurgad. 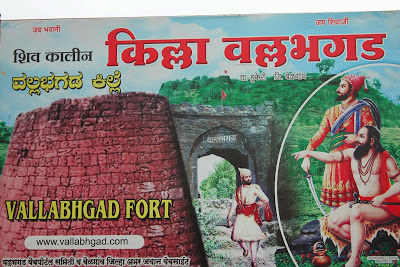 The website www.vallabhgad.com does exist, just one page with beautiful pictures of Shivaraya alias Chatrapati Shivaji.